What Do You Want to Paint? I want to share a bit of a story about some of my paintings. 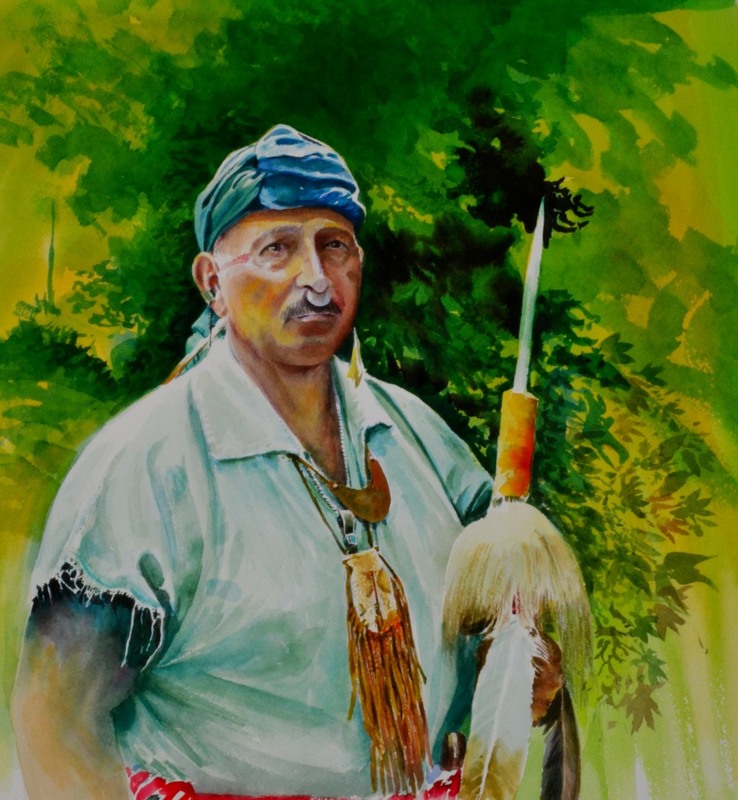 I have been painting Indians for about 20 years or more. These are not made up characters. Rather, they are friends and relatives who hold deeply to their traditions. They are living human beings that I have known for many years. We have laughed and cried together, we have faced challenges together. A lot of folks don’t understand because they don’t have similar experiences in their life. I’ve had some who would often say, “Oh no, are you painting ANOTHER Indian?” Well, yeah I am. I’ve had occasions when I have asked myself, what is the point? Sometimes it gets hard to continue on a road. This is true when you get a lot of questions about why you are following a given path. About 3 years ago a dear lady named Mary Whyte took a look at some of my paintings of my relatives and friends. One of her comments was, “Hey, I think you are on to something here. Keep it up!” Well, I have and now I am looking at a possible traveling exhibition that will record a little known portion of America. Why am I telling you this? I have a motive. I can write reams about watercolor technique or the do’s and don’ts of just about any technique. You must remember one thing. Technique is only a part of the equation. What is in your heart? What drives you to paint? What are you willing to continue to paint even if no one else understands? Perhaps better stated what is it that you can’t avoid painting? What draws you, what drives you to pick up that brush and try one more time? What ever that something is; that is your passion. I do paint other subjects. I recall listening to Raymond Kinstler urging us to not only paint figures but paint landscapes, paint still life. Get outside and paint. Leave the fear behind. Certainly learn some techniques. Find the best instructors you can and above all paint. The more you paint, the more you learn. I hope my words don’t make it sound too simple. No, it is hard work. However, it is work that brings joy. Every one of you who reads this has a still small voice inside of you. You have your likes and your dislikes. Find your path and travel it. Listen to your heart. Yes, technique is important. Make your brush strokes count. Do you merely want to render a surface or do you want to use strokes that help build the sense of form. Think about this. Do you know what your colors can do? Mix them to find out. Write notes so you will remember. Pretty soon it will become a part of you. 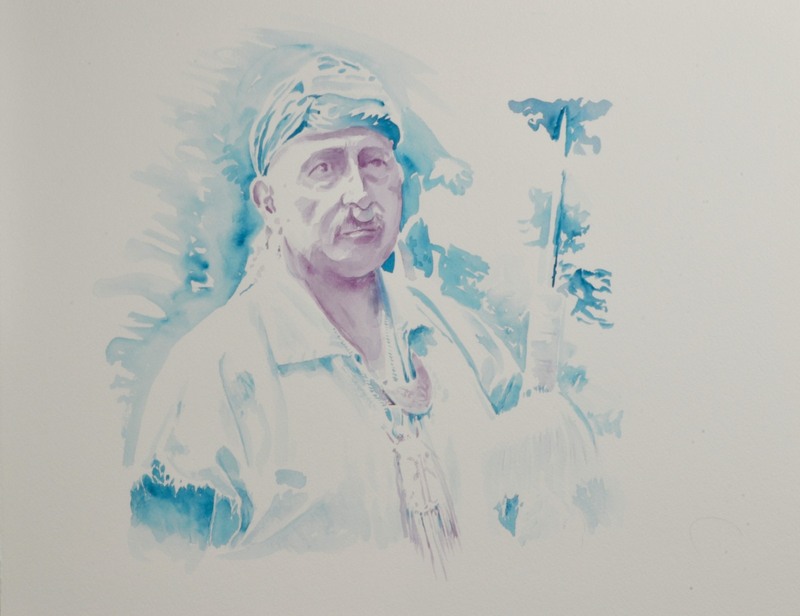 If you have read this post you know that I have produced a new on-line watercolor course. I designed it with a method in mind. It is one thing to demonstrate or show finished watercolors. It is quite another thing to share principles. I developed several easy exercises. Nothing complicated. Just simple exercises that will help build confidence and share knowledge. The tutorials cover fundamental elements like paper, paints and brush handling; it is these things that build competence. Nothing fancy, at first. It helps you plant a seed. Nurture it with thought and work. Watch it as it grows. You can analyze this foundation below. Under painting: this is the foundation. Two colors; Holbein Marine Blue and Winsor & Newton Permanent Magenta were used. Note the areas of concentration. Both colors are staining colors which means they are not likely to be lifted or disturbed by additional washes applied over them. Also note that in some areas the wash is applied directly to dry paper. How can you tell? Look at the edges. If they are sharp and crisp it is a light wash applied directly to dry paper. At the end of the arm and around the back of the head you see soft edges. Some are wet ‘n wet while other areas were applied in a direct manner and the edges were softened with clear water. The colors were chosen for their staining ability to help create transparent washes but also because they can help amplify the effect of flesh. Use the technique to create an effect. Use your brush to suggest form not to just merely color in an area. Even a pointed round red sable has the ability to create interesting texture by dragging the side of the brush across the paper. Experiment, explore. Want to know more about watercolor? 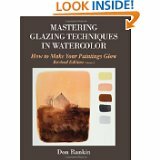 On-line watercolor course, by Don Rankin lifetime access. Watch the lesson, do the lesson, learn the lesson. Review as often as you like. https://www.udemy.com/mastering-glazing-techniques-in-watercolor Regular price $49 .There may still be some reduced coupons available at $20 off the regular price. MGTIWa. Slots limited!